I had no expectations starting this game. I’ve been listening to So..Videogames podcast where they thought it was so bad they just made it past the tutorial. I think that is a shame because this game is awesome! The first thing that stroke me was the graphics. I had no idea that my PS4 could do those things. It looks incredible, and when I upgraded my TV to an OLED with HDR - holy baloney! The graphics are so good it distracts me. There is a whole lot of fighting going on, but wait a minute, I just need to stop and look at this view. This leads us to the world. I’m a bit tired of sandboxes. Huge sprawling worlds with nothing to do. Horizon is not a bit like that. It is like everywhere you look it’s a post card. Each part of this world is so well crafted, and when you get to the sites where the machines of the old world have exploded or something, the site just steams with atmosphere. I have not seen such sandbox before that feels so alive! Filled with robots!? The enemy design got at me at first. They are robots that looks like animals. You have a bow and arrow, and the way these robots move they are very hard to hit before you figured out their movement. I kept missing them completely, they were all around me and when I turned around they seemed to already have moved. Then you get into it. You start predicting their movement and start hitting their sweet spots, and it is so rewarding. Then you meet your first sabertooth, and boy. That is a big machine! And it looks deadly. When it charges, I nearly pissed myself. That is when you understand that the fighting in this game is also tactical. You have these traps and grenades for a reason, to use them. You start stalking out your pray, putting traps in their patrol path and bam! you pick off those component and kill even the largest mechanical beasts in no time. 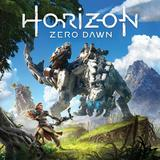 The main protagonist is a young woman named Aloy. She is incredible! I love her, I want to get a poster and frame it on my wall. It is obvious that she is crafted with a lot of love. Her character model is great, the way she moves, the way she talks and her script is fantastic. If everything else in the game was crap it would still be worth playing because of Aloy. She takes over my #1 female video game character from Jade in Beyond Good & Evil, without a sweat. After credits rolled I want to keep playing just so I can spend more time with Aloy. That is how great my affection for this character is. However (yes, lets get to the critique) ... the other characters in this game are not as memorable. I can’t remember the names of most of them, and some very important story characters from the old world are just a mush to me. They blend into each other and I can’t remember who’s who. I can’t even remember what the name of the main human antagonist is. He’s introduced in the beginning, appears in the middle and then you fight him in the end, but they fail to build a story around him. They fail to make the connection. That is a shame. I like the main story. It is ok. The world building, the history and the context of which all this is happening is great! But the path that Aloy takes is very linear. While the world constantly surprises and throws knowledge and context at you, you didn’t expect; the protagonist’s story line only fulfills its own premise. It does nothing else, which makes me kind of sad. While the robots are awesome, the human enemies are so boring, and the game will throw wave after wave of trash mobs at you until you just want it to stop. Let me just get through! I don’t care about killing 1000 generic dudes to get to the boss. Oh, and the bosses aren’t great. They are just regular machines you haven’t been introduced to yet. The human bosses are even worse - just regular dudes with a huge health pool. I hate it when games does that. There is a crafting system that is quite useless, and the skill tree is neither particularly good. The skills are unimaginative and some of them are just “find more flowers”, “hit harder”. I think this game is really worth playing because the good parts are really good. Then you need to endure repetitive gameplay, because it’s worth it. I will most likely return one day to play the DLC.